A stockbroker, share broker (in India), registered representative (in the United States and Canada), trading representative (in Singapore), or more broadly, an investment broker, investment adviser, financial adviser, wealth manager, or investment professional is a regulated broker, broker-dealer, or Registered Investment Adviser (in the United States) who may provide financial advisory and investment management services and execute transactions such as the purchase or sale of stocks and other investments to financial market participants in return for a commission, markup, or fee, which could be based on a flat rate, percentage of assets, or hourly rate. Examples of professional designations held by individuals in this field, which affects the types of investments they are permitted to sell and the services they provide include Chartered Financial Consultants, Certified Financial Planners or Chartered Financial Analysts (in the United States), Chartered Strategic Wealth Professionals (in Canada), Chartered Financial Planners (in the UK), and Master of Business Administration. The Financial Industry Regulatory Authority (FINRA) provides an online tool designed to help understand professional designations in the United States. A stock trader with a multi-monitor workstation, including a Bloomberg Terminal. Courtyard of the Amsterdam Stock Exchange (Beurs van Hendrick de Keyser) by Emanuel de Witte, 1653. The first recorded buying and selling of shares occurred in Rome in the 2nd century BC. After the Fall of the Western Roman Empire, stockbroking did not become a profession until after the Renaissance, when government bonds were traded in Italian city-states such as Genoa and Venice. 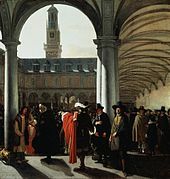 In 1602, the Amsterdam Stock Exchange (now Euronext Amsterdam) became the first official stock market with trading in shares of the Dutch East India Company, the first company to issue stock. In 1698, the London Stock Exchange, opened at a coffeehouse. On May 17, 1792, the New York Stock Exchange opened under a platanus occidentalis (buttonwood tree) in New York City, as 24 stockbrokers signed the Buttonwood Agreement, agreeing to trade five securities under that buttonwood tree. Investment professionals that offer financial advice in Australia must pass training pursuant to RG146 and hold a license that is overseen by the Australian Securities and Investments Commission. They are subject to fiduciary obligations. In Canada, to be licensed as a "Registered Representative" or an "Investment Advisor" and thus be qualified to offer investment advice and trade all instruments with the exception of derivatives, an individual employed by an investment firm must have completed the Canadian Securities Course (CSC), the Conduct & Practices Handbook (CPH), and the 90-day Investment Advisor Training Program (IATP). Within 30 months of obtaining designation as a "Registered Representative", the registrant is further required to meet the post-licensing proficiency requirement to complete the Wealth Management Essentials course (WME). A Registered Representative is also required to complete 30 hours of professional development (product knowledge) and 12 hours of compliance training every three year continuing education cycle as set out by the Investment Industry Regulatory Organization of Canada (IIROC). To trade options and/or futures, a Registered Representative must pass the Derivatives Fundamentals Course (DFC) in addition to the Options Licensing Course (OLC) and/or the Futures Licensing Course (FLC), or alternatively, the Derivatives Fundamentals Options Licensing Course (DFOL) for options. In Hong Kong, to become a representative one has to work for a licensed firm and pass 3 exams to prove competency. Passing a fourth exam results in obtaining a 'specialist' license. All tests can be taken with the Hong Kong Securities Institute (HKSI). After passing all tests, approval must be received by the Securities and Futures Commission. Share brokers in India are governed by the Securities and Exchange Board of India Act, 1992 and brokers must register with the Securities and Exchange Board of India. The National Stock Exchange of India and the Bombay Stock Exchange offer certification courses. In New Zealand, the New Zealand Qualifications Authority oversees qualifications. The New Zealand Certificate in Financial Services (Level 5) is the minimum level of qualification necessary to offer investment advice. In Singapore, becoming a trading representative requires passing 4 exams, Modules 1A, 5, 6 and 6A, from the Institute of Banking and Finance and applying for the license through MAS and SGX. In South Korea, the Korea Financial Investment Association oversees the licensing of investment professionals. Stockbroking is a regulated profession in the United Kingdom and brokers must achieve a recognised qualification from the Appropriate Qualifications list of the Financial Conduct Authority (FCA). The Chartered Institute for Securities & Investment (CISI) is the largest UK professional body for investment professionals. It evolved from the London Stock Exchange, has around 40,000 members in over 100 countries and delivers more than 37,000 exams each year. CFA UK also offers qualifications. It represents the interests of around 11,000 investment professionals and is part of the worldwide network of members of the CFA Institute. The Financial Industry Regulatory Authority (FINRA), a self-regulatory organization, regulates investment professionals in the United States. Exams that individuals may take for accreditation include the Series 7 exam, the Uniform Securities Agent State Law Exam (Series 63), the Uniform Combined State Law Exam (Series 66), and the Uniform Investment Adviser Law Exam (Series 65). Individuals holding some of those licenses, such as the Series 6 exam, cannot be called stockbrokers since they are prohibited from selling stocks. Selling variable products, such as a variable annuity contract or variable universal life insurance policy, typically requires the broker to also have one or another state insurance department licenses. Individuals and firms are regulated by the U.S. Securities and Exchange Commission and laws related to the Investment Advisers Act of 1940, including laws related to fiduciary. Wikimedia Commons has media related to Stockbrokers. ^ "Understanding Professional Designations". Financial Industry Regulatory Authority. ^ BEATTIE, ANDREW (December 13, 2017). "What Was the First Company to Issue Stock?". Investopedia. ^ "Stockbroker 101 - A Cool History". Stockbroker 101. ^ "History of the NY Stock Exchange". Library of Congress. May 2004. ^ "Financial advice". Australian Securities and Investments Commission. ^ "CSI Career Map - CSI Global Education". Canadian Securities Institute. ^ "CONTINUING EDUCATION/APPROVAL CATEGORY CHART" (PDF). Investment Industry Regulatory Organization of Canada. ^ "Continuing Education & Member Resources". Investment Industry Regulatory Organization of Canada. ^ "For Individuals Seeking to Complete the Level 5 qualification". Skills Organisation.